 Seven glass jars - enough for the whole family - the 6 oz. Glass jars are BPA free and comes with tight, no Leak screw caps. Store in the fridge, take to work or school, for an on- the- go healthy snack.  Super easy to use digital incubator machine - built-in digital timer makes it easy to use and program. Simply pour your creamy yogurt mix into the jars and leave for up to 15 hours or until it reaches your desired Thickness. 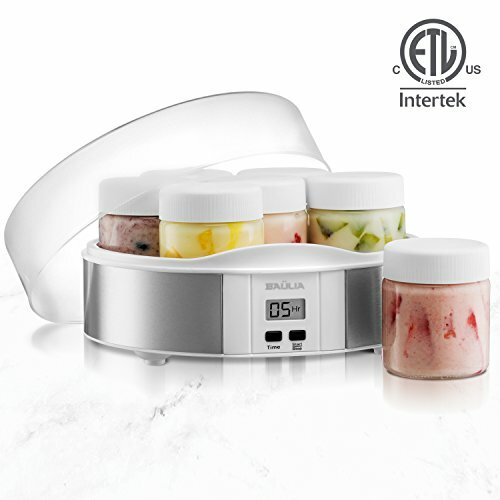  Economical, delicious & nutritious - use this yogurt Dehydrator to make you very own soft yogurt free of preservatives, coloring, sugar, sweeteners or artificial flavors that even tastes better than pre-packaged yogurt.  Prevent hazards and fire risk with automatic shut off - go to work for the day, or go to sleep for the night. Leave your yogurt maker machine to do its thing, it will shut off automatically once the timer is up.